Have you ever tried to fit an entire landscape into a tiny little ball? Well, it is possible, if you’re using a crystal ball. 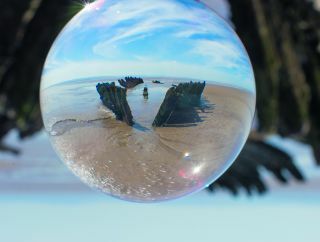 Place a crystal ball down in front of a scene, and you can shoot the view as it distorts and refracts through the crystal (or glass) and reaches your camera. The more colourful and impressive the scene in front of you, the more impressive your refracted image will be. Don’t just dump your crystal ball down in front of the first flower you see; find a cool landscape to photograph. Take a cloth as well, to wipe dirt from the ball. Find a level surface to balance your ball on. (The first time we placed the ball down it started rolling away, and when it did it got dirty quickly.) If you can’t find one, use a pedestal or mount to hold the ball in place – as our Quick Tip above explains, holding it is a bad idea! Use aperture-priority mode, and set an aperture of around f/5.6 at ISO100. Set single-point AF and place the AF point over the ball. Half-press the shutter button to focus on the scene in the ball. Zoom in on the LCD to ensure it’s sharp. If the AF struggles, focus manually.